The Power of Fruits and Vegetables! The obesity epidemic is growing out of hand with its constant growing numbers in not only the United States, but all over the world! People are resorting more to fast food, highly processed, high fat meals that offer very little nutritional value and very high calories. Et her it is a financial excuse, lack of time or energy, or even lack of access to fresh fruits and vegetables. Every population has a different excuse based on numerous factors that impact their food choices. However, it is important to note that we LIVE in our bodies! Just like we all live in houses that we must maintain in order to keep using on a daily basis, our bodies are essentially our house where WE live, grow, and thrive! Our health is priceless and when I hear people complaining about the high price of food and I even sometimes do this, I remember that where else am I going to be spending my money. Your income should go to the most important and crucial aspects of your life that can sustain your living. Living utilities, rent, schooling, insurance, taxes, and food. If money is an issue for you, than I suggest making sure that the food you buy is the best quality and skipping on other things like expensive clothing/technology because these things can all go away but your body stays with you forever. Once you have hurt you body and diminished your health, then it is extremely difficult to get it back to where it was originally. There are many studies that suggest that eating 5 or more serving of fruits and vegetables eve ryday can promote longevity for your health, decrease your chance of developing cardiovascular disease, and decrease your chance of obesity. Not only do fruits and vegetables contain many essential vitamins and nutrients for the body, the are also full of fiber and simple sugars that are easily digested by the body to cleanse it and provide it with sustainable energy. According to a study conducted by the American Journal of Clinical Nutrition, the sugar found in fruits can actually help those with diabetes! 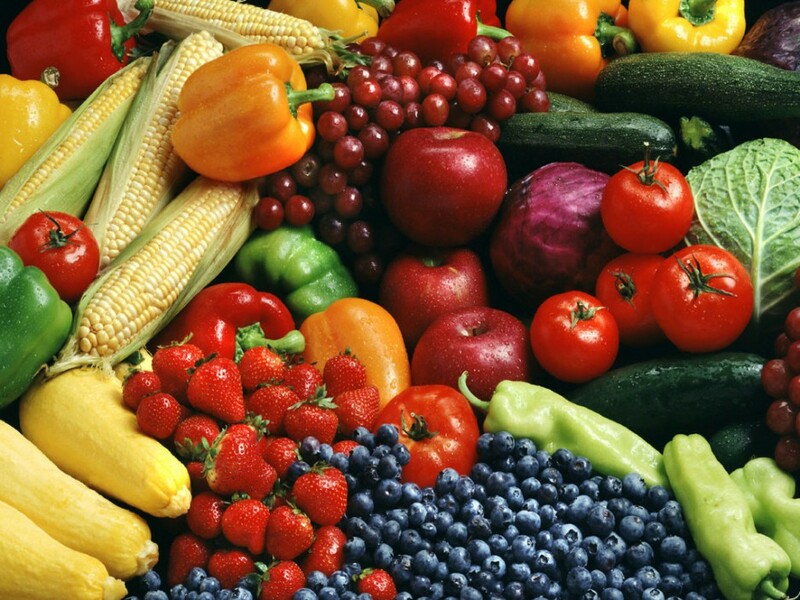 There are many ways to incorporate fruits and vegetables into your diet. YOU must be willing to change the way you eat. Once you cut out the unnecessary junk in your diet, you will start to appreciate natures most valuable possessions, the pure tastes of fruits and vegetables. Once you reduce your intake of added sugars, you will appreciate the fragrant sugars present in fruits and the tender crispness of a broccoli. Drinking smoothies and juices, eating fruit salads, raw fruit, cooked or raw vegetables, any way consumed, the benefits of fruits and vegetables are countless. I suggest checking out FullyRaw Kristina, a fruit and vegetable “celebrity”. She is a raw vegan, meaning she ONLY consumes raw fruits and vegetables. No meat, dairy, grains, or anything co oked. She is truly inspiring and encouraging people everyday to consume more of the colorful beauty nature has to offer. She is simply BEAUTIFUL! ❤ Check out her YouTube channel where she talks about how she does this, how to overcome obstacles while consuming this kind of diet, and for AMAZING recipes! Here is her FullyRaw Sunburst juice that is packed with vitamins A, K, C and helps with inflammation, arthritis, acne, digestion, and migraines. Run all ingredients through your juicer, strain, and enjoy! Check out the chart below for all the wonderful benefits of fruits and vegetables! Growing up with middle eastern decent, I am used to eating a “mediterranean diet” or essentially a diet rich in meats, grains, vegetables, fruits, and olive oi l being my primary source of fat. 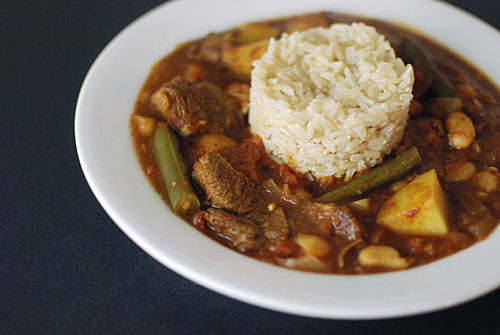 Arabs, Persians, and Turks enjoy eating different kinds of stews made with vegetables like okra, grean beans, black eyed peas, and cannilini beans with juicy chunks of lamb over rice. This is a staple household meal that is loved by many because it encompasses all the facets of being a full complete wholesome meal. Salads are another food staple for almost any dinner table and they range from an extremely simple tomato cucumber salad with olive oil and lemon to more elaborate salads like fatoush, tabbouli, and the famous Turkish patlicanli salatasi. Our salads are colorful and hearty and often times enhanced by bright flavors of mint, lemon, and drizzled with olive oil. 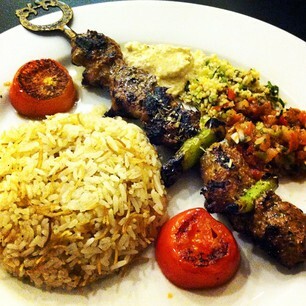 Kebabs- we love eating meat…thats an understatement actually. It would almost be a sin for any Arab to be vegetarian because our cuisine revolves around meat…kebabs, koftes, and used as a stuffing. Theres nothing better than a family barbecue that includes big juicy chunks of lamb marinated and grilled to perfection and heavily spiced beef koftes. Grains- Rice, couscous, and bulgur are the most commonly used grains in the Middle Eastern cuisine. Rice types vary based on the meal, but the most popular is the basmati because of how light and fluffy it is making it applicable and appropriate to use with a wide variety of dishes. Couscous is consumed more by the Moroccans and Tunisians as they treat this fragile grain as rice. However, couscous can also be consumed as a sweet dish and is known in Egypt as dessert that is cooked and sautéed in butter and topped with sugar, cinnamon, nuts, and raisins. Bulgur is another versatile grain and is actually one of the most nutritious because of its high fiber content and whole grain qualities. It is often used in the Kisir, turkish salad that mixes bulgur with red pepper paste, onions, pomegranate molasses, lemon, olive oil, tomatoes, and parsley. In addition it is also the primary ingredient in the famous tabouli salad. This grain is also cooked plain and consumed with stews, vegetables, as a side to kofte and kebabs, and many more. Dairy Products- we love a wide variety of dairy products and even drink a form of minty milk known as Persian doogh with our meals. Using fresh and the best quality dairy products is crucial to obtaining the best flavor. 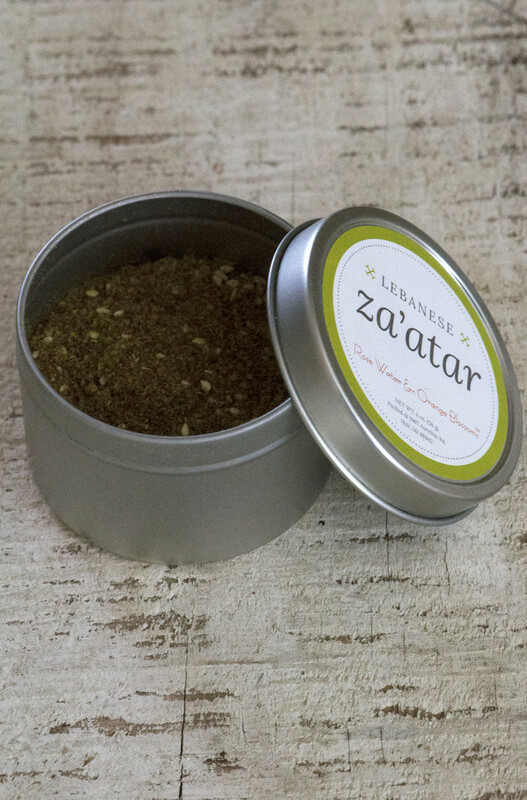 In creating labnah, a Lebanese dip made from cream and topped with olive oil, olives, and more zaater (picture to the left). The Persian doogh is made from yogurt that has been watered down and mixed with dried mint(picture to the right). In addition, we also LOVE our feta cheese and use it for everything. Added to salads, sandwiches, a breakfast staple, and even sometimes on pizzas. We love yogurt so much and often times eat it plain as a side with many of our foods because of its ability to clean the palate and make and cut down through any grease/ heaviness that can be present. In fact, the CEO of Chobani, the # 1 selling greek yogurt brand in America, is a Turkish man who grew up on a farm and wanted to bring the authenticity of yogurt to America! With any cuisine and with any food, it is important to keep in mind that MODERATION is key! Yes you can eat red meat, grains, dairy, and fat. The most important thing is to enjoy the food with those you love. Its about enjoying the food in the presence of loved ones or in the case of yaprak, rolling the dolmas with those yo u love 😉 The Middle Eastern cuisine features some of the most beautiful combinations of food and spices the are enticing and fragrant. This cuisine is actually very heart healthy and low in fat because of our frequent use of olive oil as our choice of fat. We love making vegetable stews, eating plentiful of meats that are grilled and eating hearty grains like bulgur. Mix the bulgur wheat, salt, ground black pepper, red pepper flakes, tomato paste, red pepper paste and the chopped onion and mix very well. Pour the hot water over this mixture and stir, then leave to stand for about 15 minutes. It should absorb all the water by the end of this period. The bulgur should be of a dry consistency. Add the lemon juice and the pomegranate syrup together with the extra virgin olive oil and mix well again. Stir in the remaining ingredients and combine thoroughly. Check out Maureen Abood’s blog, an American- Lebanese who posts delicious authentic Lebanese/ Middle Eastern recipes!